Have you see this ongoing trend? 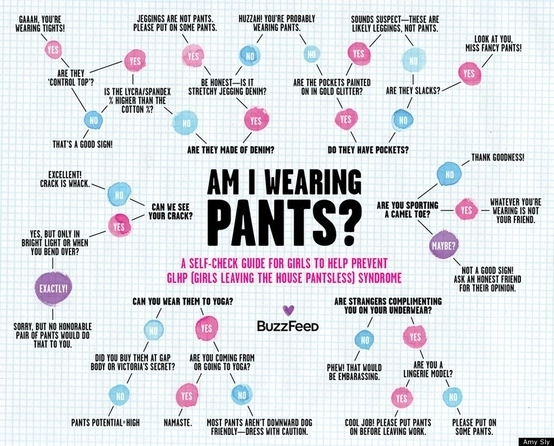 For the life of me, I can't understand why people keep wearing leggings as pants! 1) Leggings are not pants...if they are see-through. Nothing that is see-through is pants. 2) Leggings are not pants...if you can see the outline of your, um...you get the idea. 3) Leggings are not pants...if they are tights. 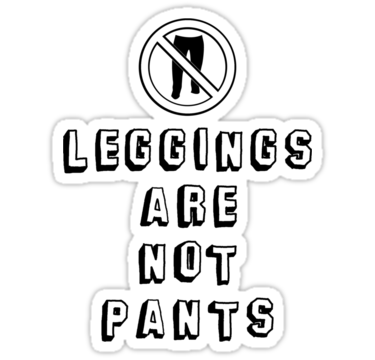 4) Leggings are not pants...even if celebrities wear them. If you, or anyone you know, suffers from the illusion that Leggings are Pants, please provide them with the 5-step program "how to adequately and sufficiently cover my behind with clothing called Pants" located in the Duh Lol Clothing 101 class. Class fees cover peanuts and appropriate slide-show. Or you could just send them this info-graphic.